ARE YOUR RADAR UNITS TRULY CERTIFIED??? Calibration, by definition, requires adjusting a radar unit to meet a manufacturer’s set of specifications on frequency and power of the microwave and setting levels in the amplifier and display circuitry. Proper calibration will result in the greatest possible performance of a radar unit. Also it will provide documentation in court that the radar meets its manufacturer’s design specifications and all applicable government specifications. Calibration is achieved by a process of aligning the microwave frequency, power, and receiver sensitivity. The microwave is the transmitter and receiver of a radar. After the desired levels have been achieved in the microwave, another process of checking out the amplifier and displaying circuits follows. In most models, this requires some tuning for maximum performance. Calibration to manufacturer’s specifications can only be achieved by disassembling the radar and aligning each of these stages as the manufacturer requires. This process requires thousands of dollars of test equipment and years of experience and training. Proper and true calibration can only be achieved by this process. P B Electronics is a “factory authorized” service and warranty center and has FCC Licensed technicians. P B Electronics has repaired and certified thousands of radar units for over 27 years without having ever lost a court case due to improper calibration procedures. See many Reconditioned Radar for sale on these pages! 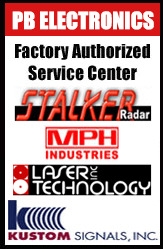 : Kustom Radar, Decatur Radar, Stalker Radar, MPH Radar, Handheld Radar Gun, and Special offers. Questions? we answer emails 7 days a week.